If you visited last Wednesday you'll have seen I decided to make a bench seat-pad for the hallway and that the existing colour scheme was all wrong. So this week I've been making Hexipuffs in greens, teals and beige. Wow - that means I've made 20 this week! I didn't realise that. Each one takes between 40 mins and an hour depending on whether I have to pick-up-and-put-down, which I usually do if the children are here/awake. The aim is to get one done as soon as possible each day and then to cast on another which can be picked up whenever I get the chance (mealtimes are good as the kids can take an hour to eat and I sit knitting and chatting to them) but I must have made quite a few in the evenings too. And look at this parcel which just arrived from the The Knitting Goddess mini-skein club. Aren't they just perfect colours *does a little dance* I can't wait to get started on them. Sadly, Little Miss and a Gruffalo have run off with them, so it looks like I'll have to wait. I'm going to pop the kettle on and have a quick catch up with the other One-a-Day posts while she's occupied, but while I have lots of crochet people visiting I wonder if would anyone be able to tell me if they recognise this motif and where I might be able to find it? I can't find any info on the flickr page it comes from. Your help would be appreciated. That's it from me for today, pop back tomorrow if you want to see what else I've been working on. 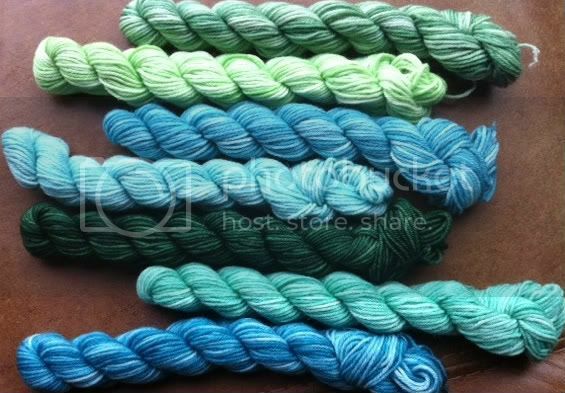 Your new skeins are looking gorgeous and the colours are perfect! Wow! Fab hexipuffs! Love the new mii skeins for them too!! Hahaha, thanks for the enthusiasm in your comment on my blog! Your new hexipuffs are really pretty and I'm sure it will fit right in with the green of your hallway! The new yarn is to die for! Wanties! I do not have time to make a beekeepers quilt. I do not have time to make a beekeepers quilt. I do not have tme to make a beekeepers quilt. Wow, it looks amazing. I´m so in love with it!!! I can´t help you with the crochet motif, I wish I could! The hexipuffs are getting nicer by the day! What will you do with your new yarn? Your hexipuffs are beautiful, it's lovely to see it grow week by week and the colours continue to dazzle. I had a look at the motif but I didn't recognise it, I'l keep my eyes open though, I like an internet hunting challenge! Sorry to delete the above post, stupid predictive typing had changed my words, drives me potty! I love the new tones that you've added with your latest hexipuffs. And the new yarn looks great too! 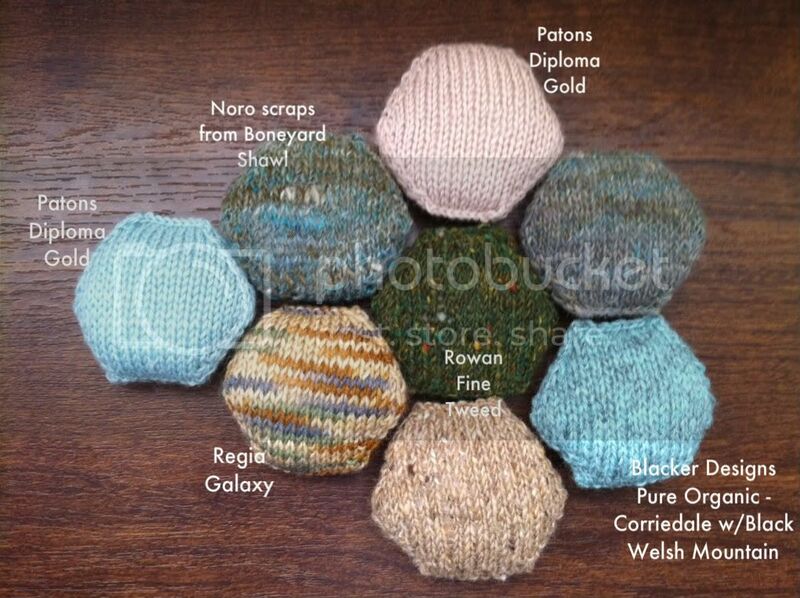 Your hexipuffs look lovely all arranged like that, your new colours will look great too I'm sure. I like the look of that blanket on pintrest, especially the Borders.....I think I must have a serious problem because each time I see a new blanket, I want to make it! They are just super adorable and OMGosh, how you laid them out! Love it! The new colours have blended it all so well it looks like you intended it all along! Gorgeous, I can't wait till the chance to make some of these beauties. Realistically be after christmas now. Now you've downsized the project we'll be able to see a beautiful FO soon! That's going to make a perfect bench pad! Great idea. 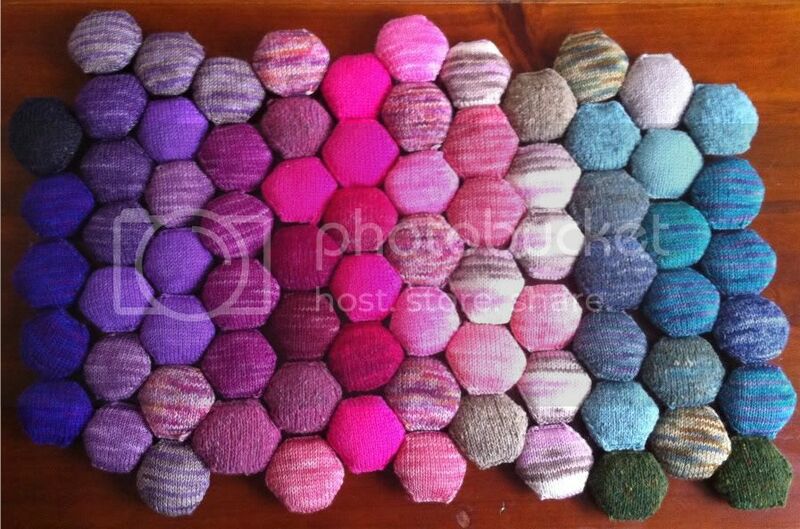 I love how you are arranging your hexipuffs. The colors just play so well together.